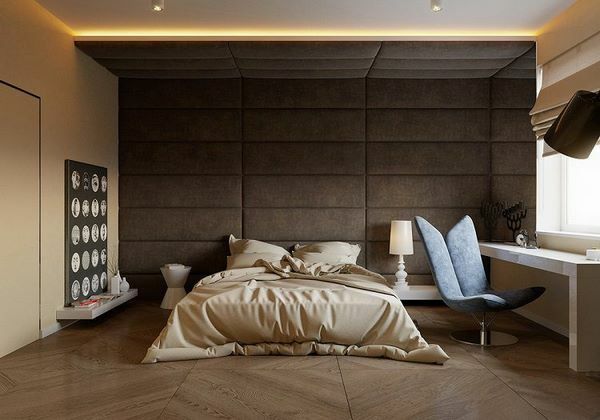 Padded wall panels in the bedroom are not only beautiful, soft and cozy but they have many practical functions as well and soundproofing and insulating are just a few of them. 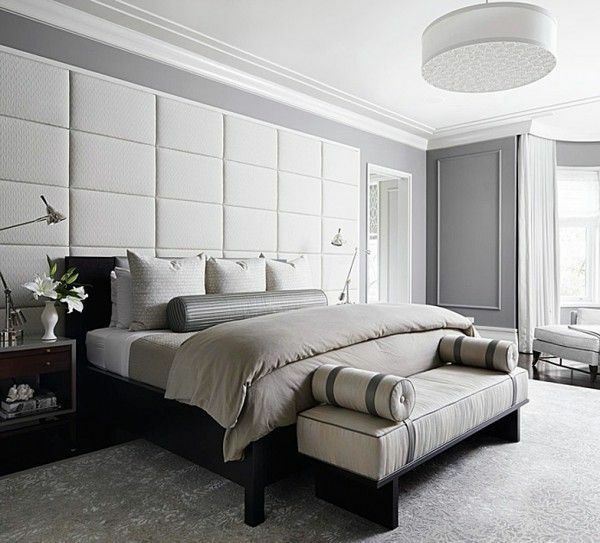 Upholstered wall panels can be custom made and are a popular type of decoration which gives the interior character and individuality. Nowadays there are numerous ways to decorate the walls and every style features different materials, patterns and designs. 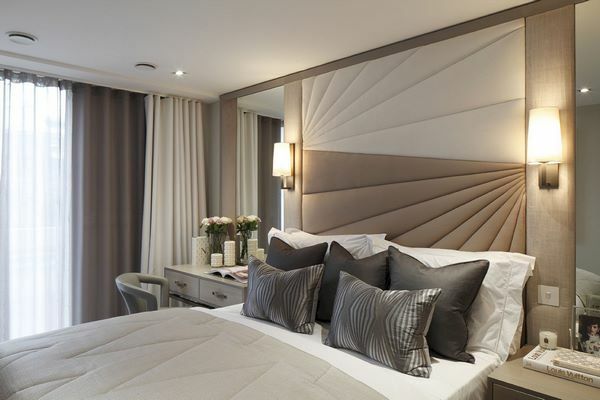 Many designers say that soft upholstered panels are a simple solution yet providing many opportunities to add visual interest and appeal to the bedroom. 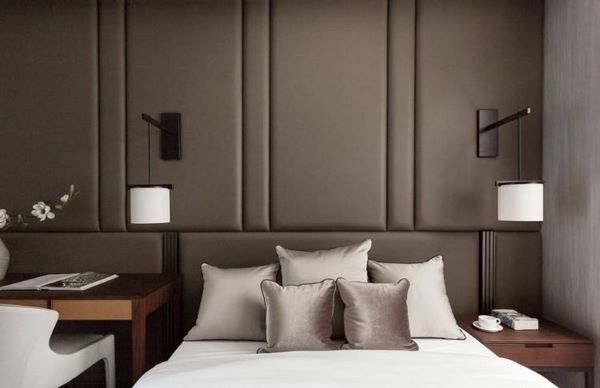 You can create different atmosphere by choosing different fabrics – silk and chiffon in gentle tones will give you a romantic appearance while leather would be the choice for a more masculine atmosphere and the perfect material for a bachelor pad, for example. 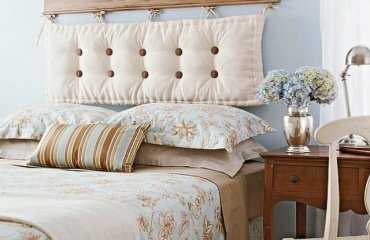 This type of decoration is made of durable high-quality upholstery materials that allow you to decorate your bedroom and panels are available in a wide range of colors and different types of materials. 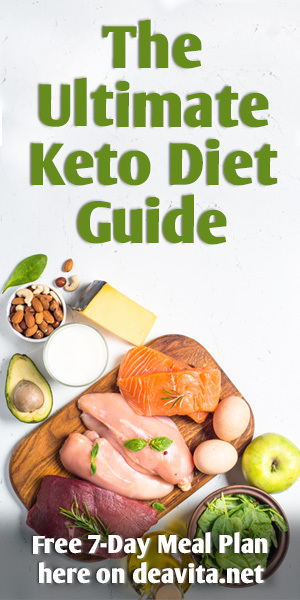 In addition, they can be manufactured in various sizes so they give you a lot of flexibility and you can use them on the entire wall or partially. 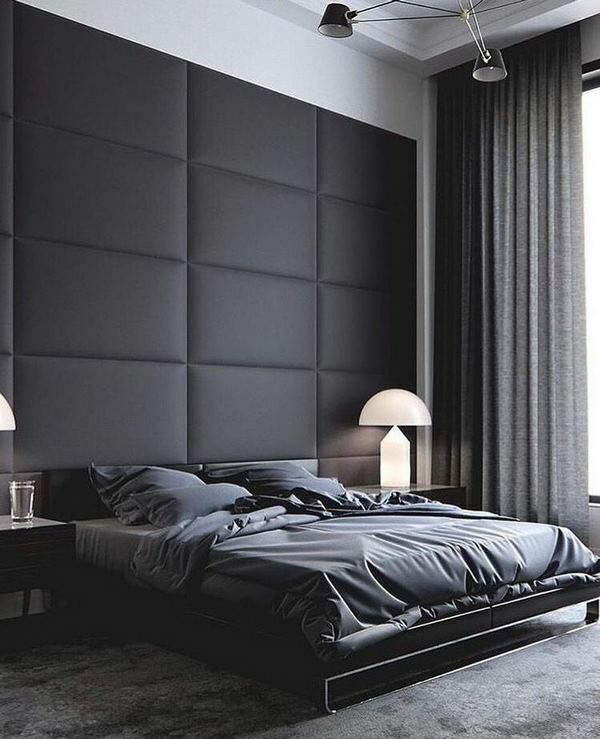 Most often the panels are used to create an accent wall behind the bed but depending on the overall design concept, they can be used on all walls as elements of the decor. 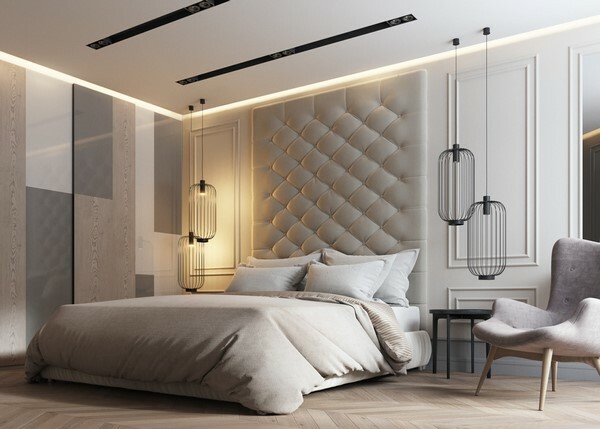 We shall give you detailed information on the different types of materials and of course, you can see inspiring bedroom interior designs and ideas how to decorate the interior and create an atmosphere of sophistication, refinement and elegant luxury. 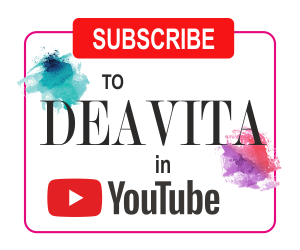 A decorative layer – natural or faux leather and fabrics. Panels can be made in a wide variety of shapes: rectangular and square, diamond-shaped or non-standard to decorate angles and bends. This is a great way to solve the problem of finishing and leveling the walls without much trouble. 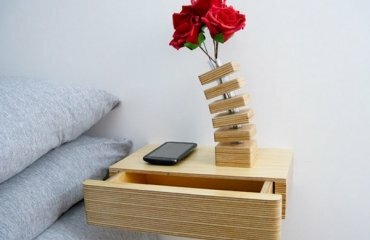 They can be used in various styles of interior – from baroque to art deco, from modern to high-tech. Easy installation – padded wall panels are installed quickly and easily. Mounting them does not require special skills and knowledge and even an inexperienced man can fix them to the wall. Provide an opportunity to hide irregularities and wall defects, as well as various wires and communications. Easy maintenance – padded wall panels can be cleaned with chemicals or just a damp cloth. Wall panels are durable and practical with excellent noise and thermal insulation properties as well as sound absorbing properties. They also have a very good resistance to mechanical stress of various types and wear resistance which determines their long service life. Environmental friendliness and safety – choosing natural materials makes padded panels safe for the occupants of the home and the environment. 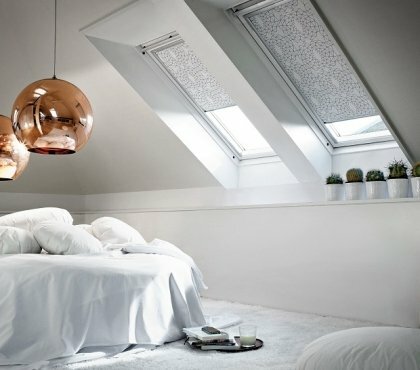 The large selection of colors and the opportunity to use different materials allows you to create a truly unique style and appearance, add gloss, luxury and individuality to your home. 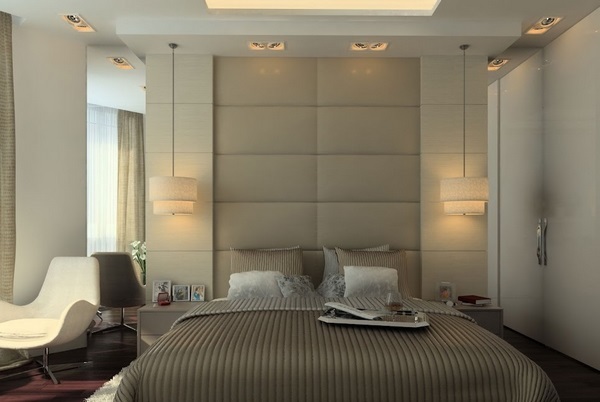 Such wall decoration makes the interior of the bedroom complete and exceptionally stylish. The upholstery options are numerous and there is something suitable for every taste. 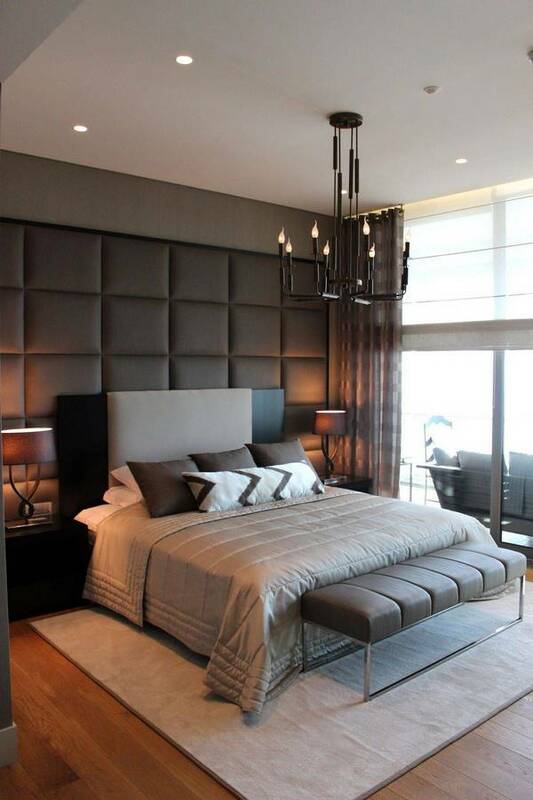 How to choose the material for your padded wall panels in the bedroom? 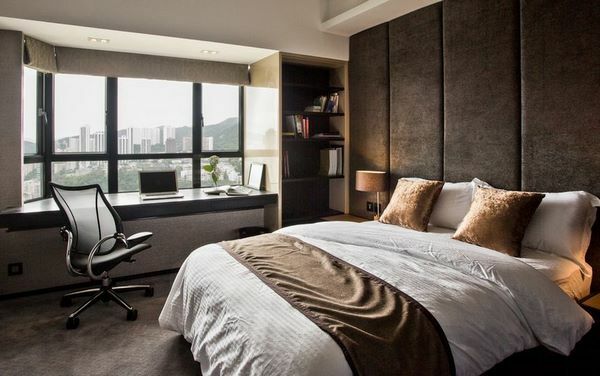 As we already mentioned, padded wall panels can be made of different materials and each of them has its own characteristics, pluses and minuses. Usually they are upholstered with leather, faux leather or textile. 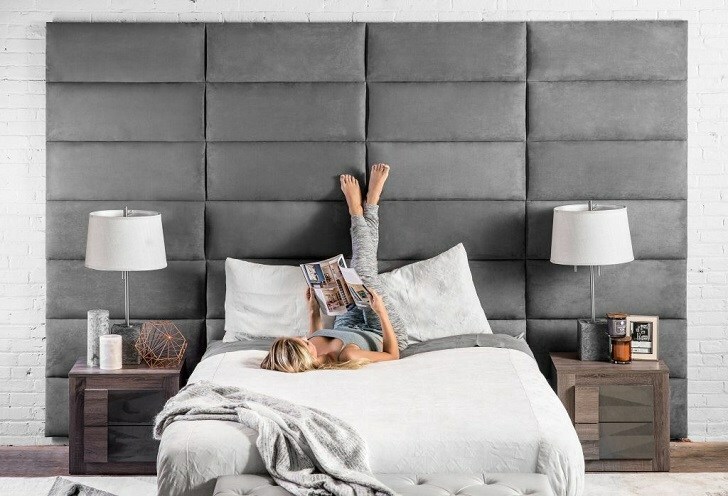 Natural leather adds a sense of luxury to the interiors and give an exclusive appearance to the bedroom. They are durable, very easy to clean and maintain and have a very long service life. 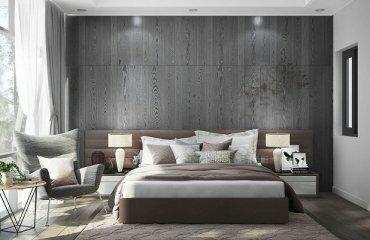 However, finishing a wall can be very expensive as high quality leather has a pretty high price tag but you can combine leather panels with wallpaper, for example. 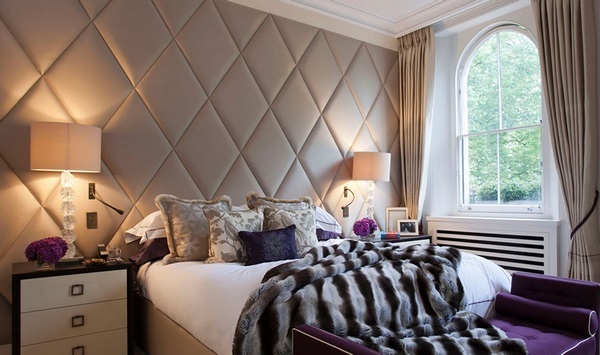 Padded wall panels upholstered with faux leather is a cheaper option. Depending on the quality of material, the appearance may vary so it is worth looking for a reputable manufacturer. Just like natural, faux leather is easy to clean and maintain but it may lose its initial appearance over the years. 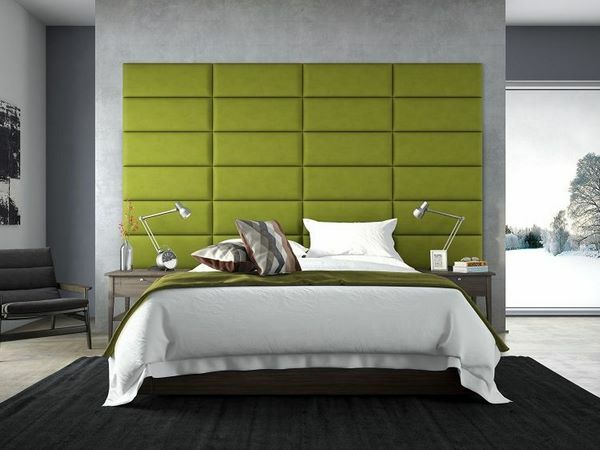 Wall panels upholstered with textile are widely popular not only because the cost is significantly lower compared to leather, but for the huge variety of colors, prints, patterns and textures. 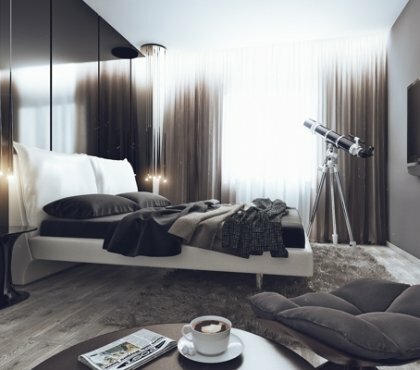 Due to this endless variety of options, it is possible to create any design and give a luxurious appearance to the bedroom for a relatively small amount of money. You can choose from silk, flax, jacquard, suede, velour and other types of fabrics depending on the design concept. 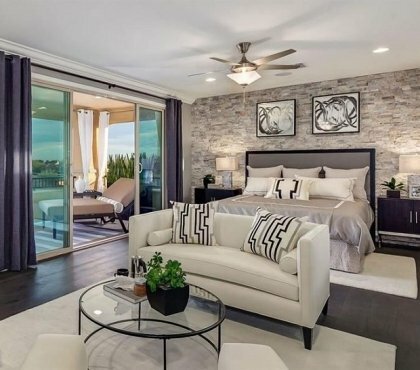 The choice of material depends entirely on the imagination of the homeowner and the overall style of the home interior. 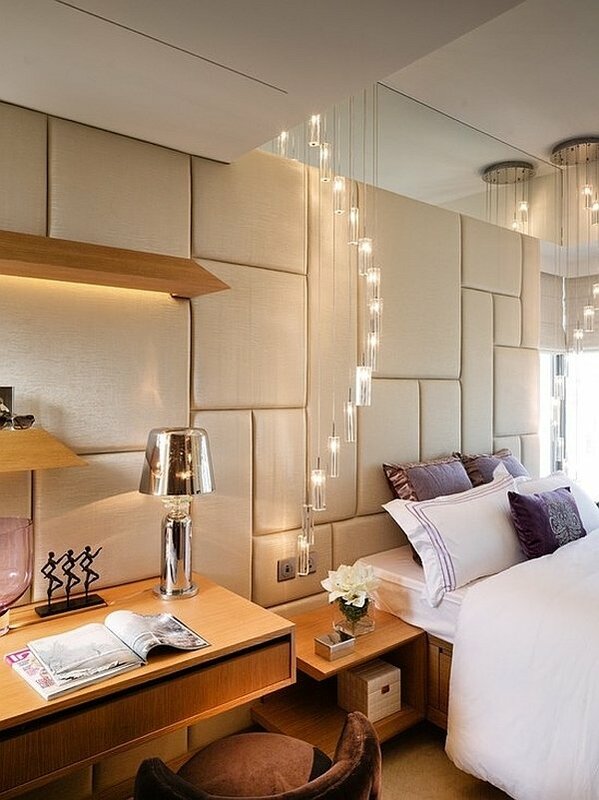 You need to think of the lighting in the bedroom as well as it will emphasize the color and texture of the fabric. Fabrics in light colors will help you make a room appear more spacious while dark ones will create a cozy and intimate atmosphere. 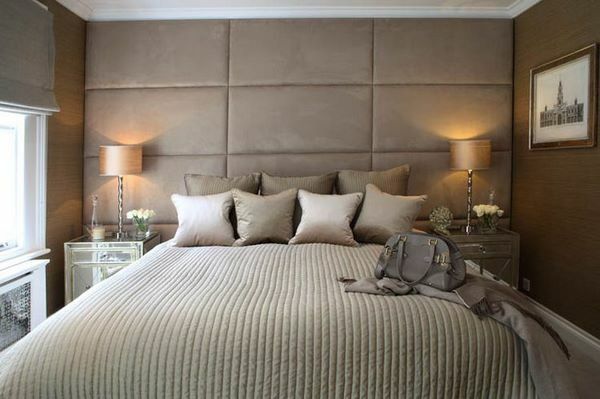 Soft fabric wall panels look great in the bedroom. 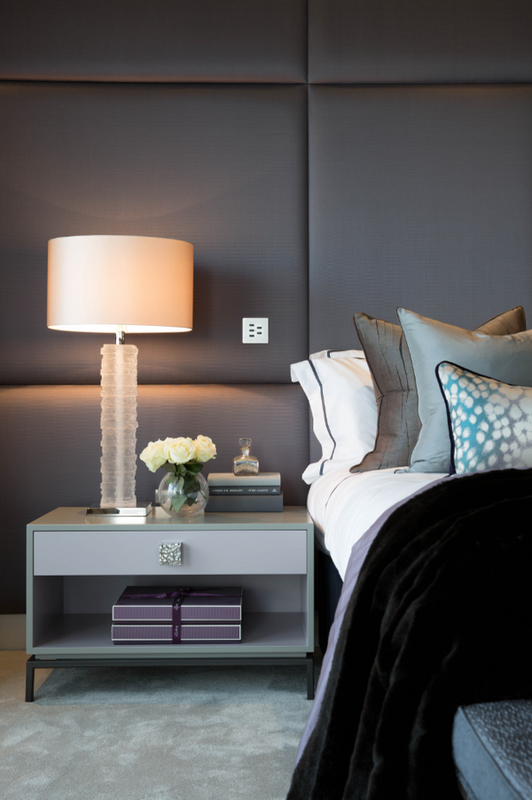 They add incredible warmth and a sense of comfort and will become the focal point in any bedroom. What is important to know when you select the material? It is very important to understand which panels will suit your taste, lifestyle and interior design. 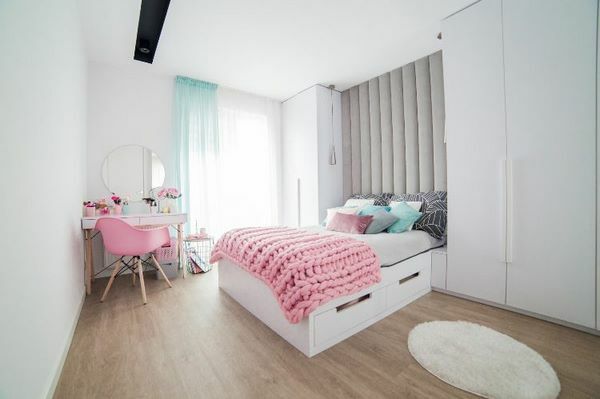 Having in mind that each homeowner would like practical and durable panels that will look good for a long time, you need to consider the properties of each material. When choosing a fabric, you need to make sure that it is strong and durable enough to maintain an attractive appearance. As a rule, the color of decorative panels is selected in the tone of other finishing materials, or used as a bright accent in the interior. 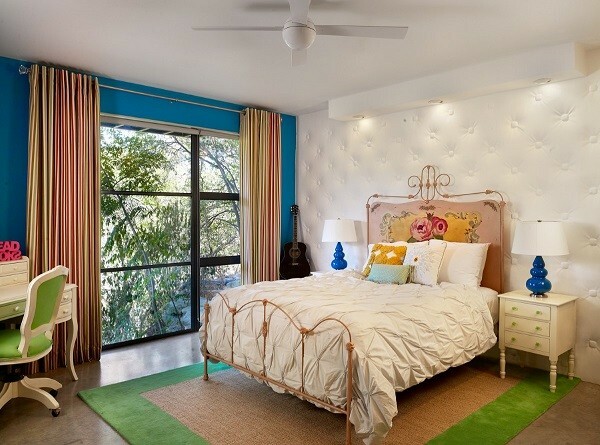 You can match the color of your wall panels with the color of the curtains and wallpaper or create a contrast. One of the ways to fix the panels on the wall is by using adhesive which is available in most hardware stores. Make sure that you have measured and marked the position of the panels. Apply the glue on the panel and fix it on the wall. Press firmly. Repeat until you fix all the panels. To fix the padded wall panels on the wall of the bedroom, any fixing bolts or screws can be used, depending on the type of base material. If this is brickwork, holes are made in advance and the panels are attached on a plywood base which is fixed to the wall. Another way is to attach the panels to a wooden frame and then fix the frame to the wall. You can use whichever method is convenient to you or hire a professional to do it, especially if you do not have any experience in DIY projects.